This Saturday – Don’t Miss it – We need YOU! Home > Our News > This Saturday – Don’t Miss it – We need YOU! 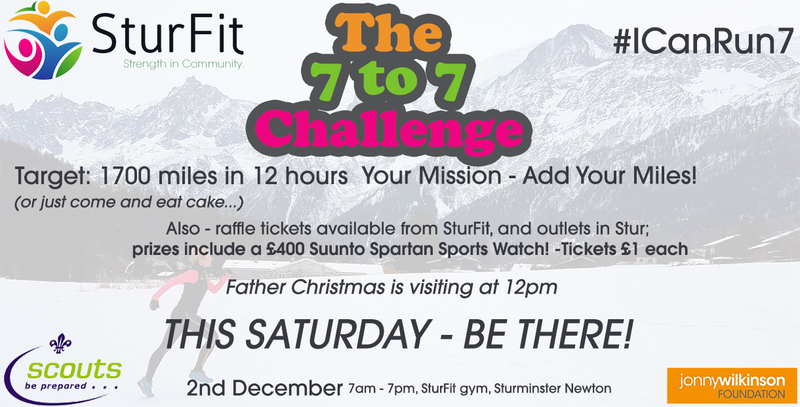 It’s finally here, the 7 to 7 challenge this Saturday! Come visit any time during that period. Run, walk, cycle, row a mile or two. Then come eat cake, drink tea or coffee or both and eat more cake. See Father Christmas and his Elf tackle the treadmill at 12pm got to be a first surely! Felling a bit achy lately? Then get a massage from our qualified sports masseuse, she’s proper good. Or just come and support this fantastic Challenge, because it’s worth it!